Eastern redbud trees can be seen in many gardens all over the United States, and now that it’s time for the seasons to change again, you might be thinking of planting one in your own garden. Here are some fascinating facts about the Eastern Redbud tree, and just why you should consider planting them around the time fall comes. The Eastern Redbud tree can be found in many parts of the United States and North America, but did you know that it’s also the state tree of Oklahoma? The beautiful blossoms of the Eastern Redbud Tree start appearing around early spring, before the leaves make their appearance. Eastern Redbud Tree can be expected to grow around 20 to 30 feet in height. This means that you should do some planning before you set out to plant them, and you might even have to do some landscaping. If you don’t want to do this yourself, you can hire a professional, licensed contractor to help you with this, Arbor Hills Trees & Landscaping. When it comes to planning planting, you should aim to plant these trees at least 12 feet apart to allow for enough room for the roots at the bottom – and the branches at the top. Anything closer and you will strangle the roots of the tree, and only notice this when the tree has grown to its full height. You can plan Eastern Redbud trees in the spring, fall or winter – but fall is best if you want happy, healthy and fast-growing Redbuds. Eastern Redbud trees are known by many different names, including the scientific name Cercis Canadensis. Sometimes they’re also referred to as the Judas-tree — and are also other varieties of Redbud trees, including the Western Redbud. But did you know that Judas-tree can also be a general term that describes a variety of flowering trees. They are so called because they come from Eastern North America, though they can be found in many other parts of the world. 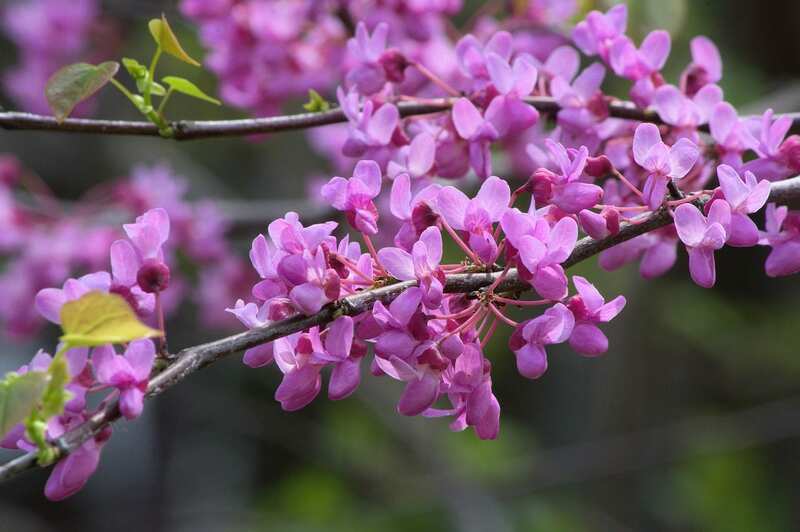 The eastern redbud tree has many practical uses: Bees and birds love the nectar – and it’s a great thing to plant if you want to attract birds to your garden. The bark, on the other hand, was boiled for whooping cough – and a preparation from the bark was used as a natural remedy for dysentery. And, the flowers are completely edible!